Marie Keefe Collins Wallisch, 76, of Larabee Street, Port Washington died Monday, May 5, 2003 at Lasata Care Center, Cedarburg, WI where she had been a resident the last 8 years. She was born May 21, 1926 in Chicago, IL, daughter of Homer and Marie Keefe Collins. On October 19, 1946, Marie married Francis “Frank” X. Wallisch, also of Chicago. In the early 1950’s Frank’s work transferred him to Port Washington, WI. There they raised their nine children. Marie finished her nursing studies and was an LPN at Heritage Nursing Home, Port Washington over 9 years. Throughout her life she was a Brownie/Girl/Cub Scout leader, religious education teacher at St. Mary’s Church and a member of their Christian Women. 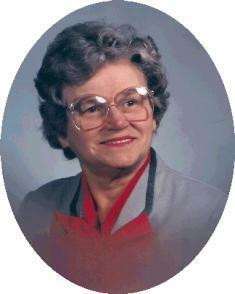 She took great pride in her family and enjoyed crossword puzzles. Marie is survived by her husband Frank, their 9 children Marie (Gary) Zirbes of Port Washington, WI; Anne (Patrick) Bauschelt of New Richmond, WI; Carolyn (Mike) Schreiner of Grafton, WI;, Jean (Dwight) Horner of Brookfield, WI; Frank (Sandy) Wallisch of Hartford, WI; Michael (Barbara) Wallisch of West Bend, WI; John “Jack” (Anne) Wallisch of Brown Deer, WI; Alan (Valerie) Wallisch of Waupan, WI; and Chuck (Lisa) Wallisch of Waubeka, WI, her sister Nancy (Charles) Frahm of Chicago, IL and her brother James (Betty) Collins of Naples, FL; further survived by 23 grandchildren and 4 great-grandchildren, other relatives and friends. A Mass of Christian Burial will be celebrated at 7:30PM Friday, May 9 at St. Peter of Alcantara Catholic Church, 1800 N. Wisconsin St., Port Washington. The Reverend Thomas Biersack of St. Alphonsus Parish, New Munster, WI will be the celebrant. Interment St. Mary’s Cemetery, Port Washington. Visitation 3-7:15PM Friday AT CHURCH with a rosary at 3:30PM. Memorials to Port Catholic School or Alzheimer’s Association appreciated.